The Grezzo “Masseria la Volpe” is an extravergine not filtered olive oil, made exclusively with Italian olives, keeping the naturalness of the just squeezed ones. Rich of polyphenols with a strong antioxidant action even on our organism. The production process of olive oil leads to a product, the oil, that contains suspended tiny olive particles (pulp and pit), which convey to the oil a cloudy, dirty green color, typical of fresh-pressed crude oil. If the oil is unfiltered, these particles will slowly deposit at the bottom of the bottle. Therefore, the presence of these particles is not to be seen as a flaw: on the contrary, it proves that the oil is unadultarated. Moreover, the presence of these tiny olive particles contribute to a light improvement in terms of healthy and nutritional contents, typical of the extravergine olive oil. 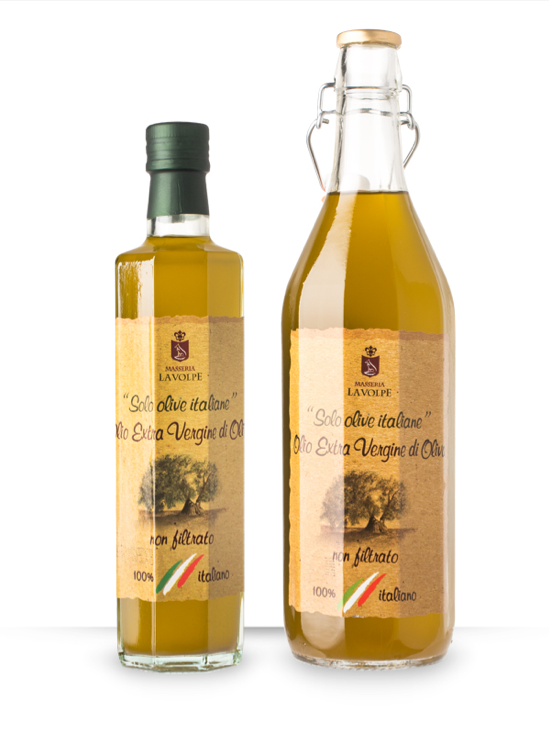 The crude “100% Italian” Extra vergin olive oil is particularly advisable for those who love to enhance food’s flavour with some extra fruity and strong taste, typical of extra vergin olive oil. Ideal as crude dressing or to use in the preparation of cooked meals, this oil improves your dishes with the taste and fragrance of selected Italian oils. Available in 1 lt. And 0.5 lt. Bottles.